US-based collection and licensing society SoundExchange paid $952.8m to artists and record labels in 2018. That figure was up 46.2% on 2017, when the organization distributed $652m to its recorded music members. The 2018 payout would have included a $150m settlement agreed with Sirius XM, which was passed to SoundExchange on or before July 7 last year. 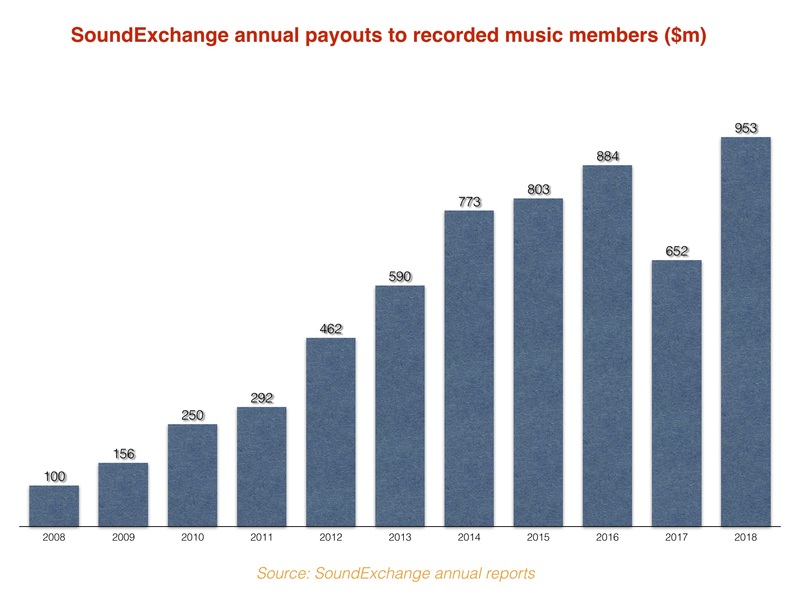 SoundExchange will have ended 2018 on the cusp of $6bn in lifetime payouts to artists and labels, after it hit the $5bn milestone at the close of 2017. The organization saw a very strong fourth quarter last year, distributing $345m to music creators – up by 115.7% on the same period in the prior year. SoundExchange collects royalties from the likes of Sirius XM (which also enjoyed a record year in 2018) for its artist and label members, as well as from other non-interactive internet radio, satellite radio and cable television services. The organization stopped collecting from Pandora’s radio tier for the major labels in 2017 (thus the 27% drop in distributions to members that year), but continues to administer collections for artists from the service. The company also celebrated the passage of the Music Modernization Act (MMA) last year, for which it was a key lobbyist. “Passage of the Music Modernization Act (MMA) was a profound policy achievement that modernized U.S. copyright laws,” said SoundExchange. “The MMA includes the CLASSICS Act, which guarantees federal copyright protection for sound recordings recorded before February 15, 1972 and ensures that legacy artists receive compensation for their work. SoundExchange paid out royalties to 34,048 members in Q4 2018, up 37.3% year-on-year. In addition to its work in recorded music, SoundExchange runs music publisher services company SXWorks, whose Board of Directors includes senior executives from major and independent music publishers.